Description: This hike follows Independent Mine Trail #808 for about 4 miles up to the summit of Lookout Mountain. Then it takes a right at the sign towards the snow shelter on Lookout Mountain Trail #804 and Mother Lode Mine Trail #808A. Be careful not to continue along the ridge line, which is also Lookout Mountain Trail #804 as this will end up at the ranger station. Continue until the junction for Mother Lode Mine Trail #808A and Lookout Mountain Trail #804. Take a left at the junction and follow Lookout Mountain Trail #804 until the parking lot. The trail meanders up through open mountain meadows and thick old growth ponderosa pine stands to the summit of Lookout Mountain. With the spectacular scenery (one can see the entire Cascade Range and Big Summit Prairie), this 7.5 mile hike will fly by! On a clear day, the summit offers views from Mt. Shasta, California all the way to Mt. Rainier, Washington. Here is a great place to stop for lunch and take in the views before continuing back down the mountain. While the view at the top is stunning, the spring and summer brings an abundance of wildflowers to enjoy along the way. Keep an eye out for signs of wildlife like deer, elk, and coyote prints. This is a vibrant hike with something for every hiker to enjoy ie. views, wildflowers, old growth trees, and possibly wildlife. On the way down Lookout Mountain Trail #804, there are beautiful streams and wildflowers that thrive in a wetter environment than the ones going up Independent Mine Trail #808. After going down through open meadows and scattered forested areas, there is a sharp right turn after which the trail becomes forested and shaded. Less than a mile after the turn to the hikers right, there will be an old Cinnabar mine up on the hill. It is possible to hike up and around this mine, which is well worth the detour. After the mine, in about a half mile the trail will pop back out at the parking lot. Directions from Bend: Begin on US-97 N toward Redmond/Portland. Continue on US-97 N for about 15 miles. Turn right on OR-126/SE Evergreen Ave. Follow OR-126 for about 17 miles. OR-126 becomes NW 3rd St/US-26 E. Continue on US-26 E for about 13 miles. Turn right onto County Road 123 for about 7.5 miles. Stay right at the junction of Forest Service Road 22 and Forest Service Road 42. Stay on Forest Service Road 42 for 7 miles. Turn right on Forest Service Road 4205 and continue on this road until it ends (approximately 1 mile). There are three trailheads here and a fair sized parking lot at the end of the road. The trailhead for Independent Mine Trail #808 is on the far left. Description: For a shorter loop hike on Lookout Mountain take Independent Mine Trail #808 for about 4 miles to the summit of Lookout Mountain. 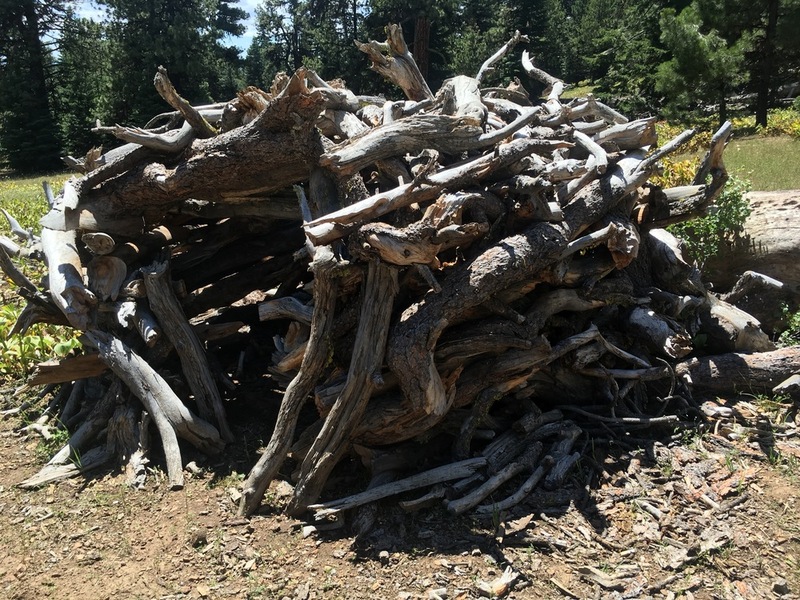 This will go through thick ponderosa pine forests and open alpine meadows with beautiful wildflowers in the spring and summer. At the summit there are truly awesome views of the Cascades on a clear day. Then follow Mother Lode Mine Trail #808A for 2 miles down the mountain ending back at the parking lot. 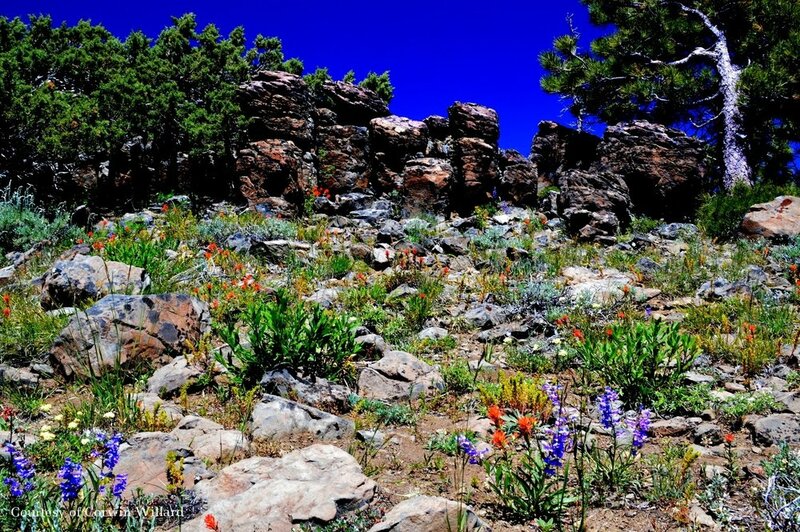 The decent trail is much steeper and shorter than the accent trail while still providing the views and wildflowers found on the other Lookout Mountain hikes. Directions from Bend: Begin on US-97 N toward Redmond/Portland. Continue on US-97 N for about 15 miles. Turn right on OR-126/SE Evergreen Ave. Follow OR-126 for about 17 miles. OR-126 becomes NW 3rd St/US-26 E. Continue on US-26 E for about 13 miles. Turn right onto County Road 123 for about 7.5 miles. Stay right at the junction of Forest Service Road 22 and Forest Service Road 42. Stay on Forest Service Road 42 for 7 miles. Turn right on Forest Service Road 4205 and continue on this road until it ends (approximately 1.5 miles). The trailhead for Independent Mine Trail #808 is on the far left. Description: While this hike is one of the longest on Lookout Mountain it also provides the broadest breath of the diversity found on the mountain. 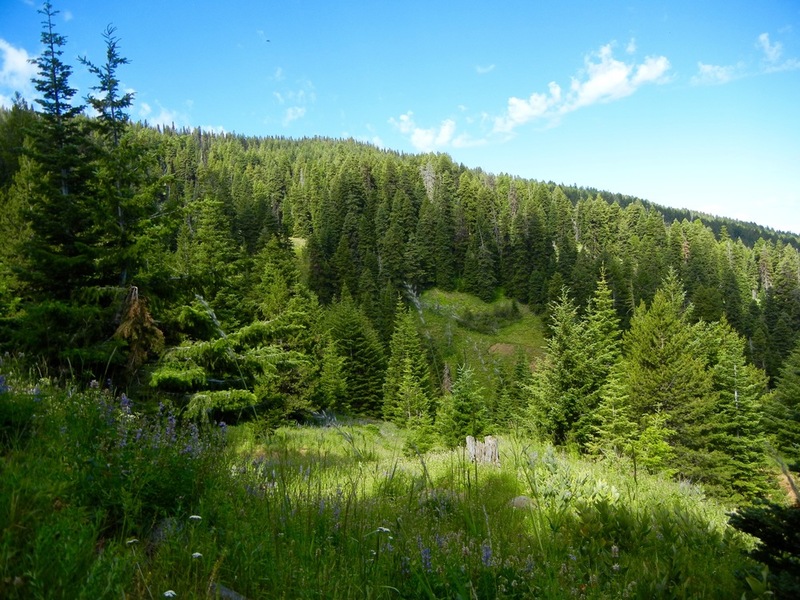 There is a mine, views of the Cascades and Big Summit Prairie, wildflowers, streams, old growth ponderosa pine, and mountain meadows. The hike begins at the Upper Lookout Mountain Trailhead #804 next to the Mother Lode Trailhead and Independent Mine Trailhead and ends at the Lower Lookout Mountain Trailhead next to the old ranger station. It is a shuttle hike so two vehicles are required. To begin, park one car at the old ranger station (directions below) and then drive to the Lookout Mountain Trailhead next to the Mother Lode Mine Trailhead (directions below). This strenuous hike climbs up by an old cinnabar mine (Mother Lode Mine) through streams, forests, and meadows to the summit of Lookout Mountain. Then the trail follows the ridge line of Lookout Mountain with panoramic views of the Cascades and Big Summit Prairie. The trail next dips into old growth ponderosa pine forest with occasional views of the Cascades. Once in the forested area, there is a steady downhill slope with minor uphill bits for about 5.5 miles until it reaches the parking lot near the old ranger station. To Lower Trailhead by the ranger station: Begin on US-97 N toward Redmond/Portland. Continue on US-97 N for about 15 miles. Turn right on OR-126/SE Evergreen Ave. Follow OR-126 for about 17 miles. OR-126 becomes NW 3rd St/US-26 E. Continue on US-26 E for about 13 miles. Turn right onto County Road 123 and continue for about 7.5 miles. The trailhead is on the right with a pullout for parking. The pullout is just before the turn off for Forest Service Road 22 and 42. Drop one car off here. Then take the other car to the Upper Trailhead. To Upper Trailhead: Begin on US-97 N toward Redmond/Portland. Continue on US-97 N for about 15 miles. Turn right on OR-126/SE Evergreen Ave. Follow OR-126 for about 17 miles. OR-126 becomes NW 3rd St/US-26 E. Continue on US-26 E for about 13 miles. Turn right onto County Road 123 for about 7.5 miles. Stay right at the junction of Forest Service Road 22 and Forest Service Road 42. Stay on Forest Service Road 42 for 7 miles. Turn right on Forest Service Road 4205 and continue on this road until it ends (approximately 1.5 miles). The trailhead for Lookout Mountain Trail #804 is on the far right. Description: This trail probably has the least traffic out of the entire Lookout Mountain trail system. Begin at the Line Butte East Trailhead. This trail goes for 1 3/4 miles through marshy meadows and old growth ponderosa pine stands until it reaches the junction for Line Butte Tie Trail #807A. There may be a fence with a gate in this marshy meadow section because of the cattle grazing in the area. The gate is open and continue to follow the trail on the other side. At the junction, there is a sign here marking it, take a right. The trail begins to enter dense forests with an occasional meadow. Follow this trail till the next junction. Just before the junction, the dense forest gives way to open meadows and panoramic views of the surrounding areas. This junction used to have a sign but it has since fallen over and the post is laying on the ground. Go left to reach the summit of Lookout Mountain. For a shorter hike go right at the junction, which goes to South Point (it is about 1/4 of a mile until the trail ends in this direction). The trail can be difficult to find past this point. However, in both directions the trail goes pretty straight. If there is trouble finding the trail look for white diamond trial markers on trees or cuts through down trees that clears a path, these are usually good signs of a trail. Line Butte Tie Trail #807A ends at the summit of Lookout Mountain where the old lookout tower used to be. Here, there are beautiful views and beautiful wildflowers to enjoy while taking a break or eating lunch. A map and GPS is suggested for this area because it is so easy to lose the trail. Directions from Bend: Note! Do not follow the Forest Service's directions on their website, the directions lead to the wrong place. To Line Butte Trailhead East (Formerly Fawn Creek Trailhead) begin on US-97 N toward Redmond/Portland. Continue on US-97 N for about 15 miles. Turn right on OR-126/SE Evergreen Ave. Follow OR-126 for about 17 miles. OR-126 becomes NW 3rd St/US-26 E. Continue on US-26 E for about 13 miles. Turn right onto County Road 123 for about 7.5 miles. Stay right at the junction of Forest Service Road 22 and Forest Service Road 42. Stay on Forest Service Road 42 for 15 miles. Turn right onto Forest Service Road 4215 and continue for 2 miles. Turn right onto Forest Service Road 4220 for 5 miles. Finally, turn right onto Forest Service Road 257 for ¾ mile. The trailhead is on the right with a small parking area. Description: This mile long loop trail is perfect for a family with kids or for people inquisitive about the ecology of the area. There are beautiful wildflowers, especially lupine and plenty of benches to rest on or simply take in the scenery. The trail goes through a beautifully forested area mostly in the shade-making it perfect for a hot day. To begin, follow a closed old road bed for about 1/4 of mile till the sign for Baneberry Trail #812 at which take a left on the trail. Follow this trail until the first interpretive sign. At the first interpretive sign it is possible to go either direction on the loop. 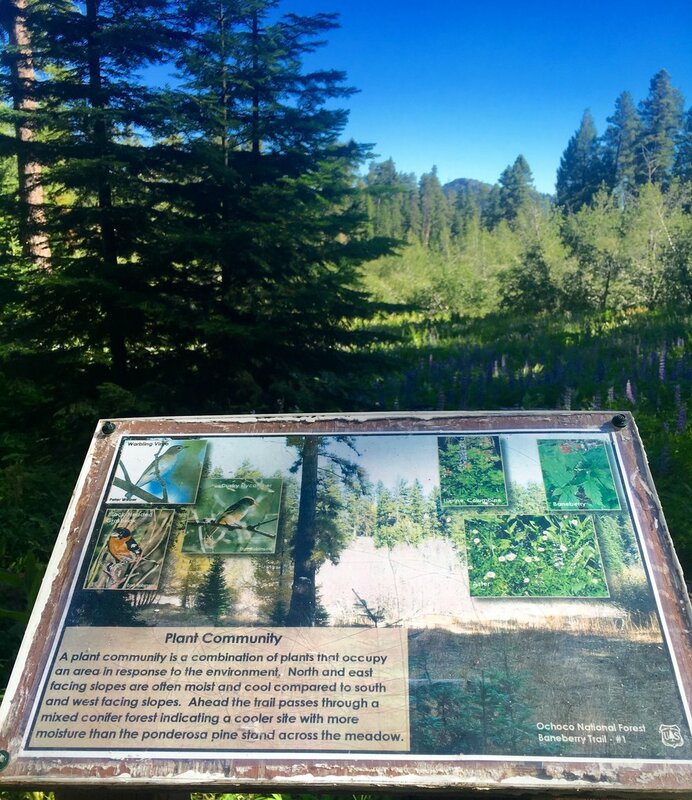 Walk around the loop looking at the interpretive signs and try to find the flora and fauna described. Beware, this trail is not well maintained so there will most likely be some down trees that will have to be climbed over. After the Baneberry Loop it is well worth the extra 1/4 mile walk to Independent Mine. To find the mine, go back to the old road bed where the turn off for the Baneberry trail is and follow it down to the old mine site. There are many buildings in this area including cabins and the mine site. Wander through the site and imagine what it would have been like being a miner living in the cabins and working at this cinnabar mine (which was used to make mercury). There are many other mines in this area many of which opened in the 1910s and closed by the 1950s. Directions from Bend: Begin on US-97 N toward Redmond/Portland. Continue on US-97 N for about 15 miles. Turn right on OR-126/SE Evergreen Ave. Follow OR-126 for about 17 miles. OR-126 becomes NW 3rd St/US-26 E. Continue on US-26 E for about 13 miles. Turn right onto County Road 123 for about 7.5 miles. Stay right at the junction of Forest Service Road 22 and Forest Service Road 42. Stay on Forest Service Road 42 for 7 miles. Turn right on Forest Service Road 4205 and continue on this road for less than a mile, the Baneberry Trailhead sign on the left.